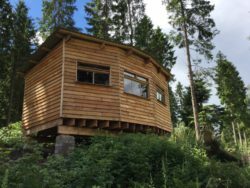 The Burnieshead Hideaway, on a lovely woodland footpath on the Cateran trail, overlooking two beaver ponds and one beaver dam, is a little bit like a wildlife watching hide, but it is also a romantic off-grid glamping hut of great charm. It has a four poster bed, built from beaver cut wood, and a woodburning stove, two armchairs and a coffee table. 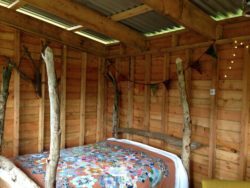 There is also a table where you can boil a kettle or cook something up on a camping gas stove and is ideal for your next ecotourism holiday. 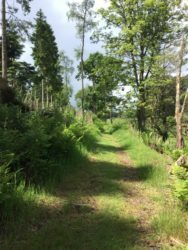 With such proximity to the beavers habitat at the front and a wood full of red squirrels behind the Hideaway is ideal for lovers of quiet places and wildlife. The bed may look unusual but it is very comfortable.